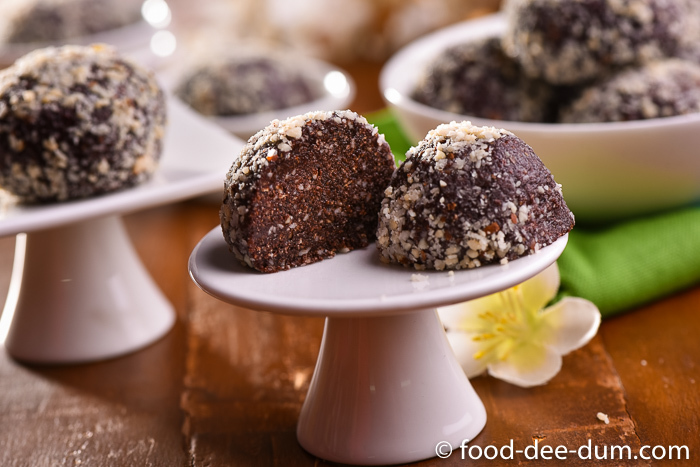 These easy chocolate almond balls are my easy cheat for a quick dessert on a weeknight. I’m not one of those people who need to have something sweet for dessert after every meal. I have never craved sugar per se. But, once in a while, I get a mad craving for something chocolate. 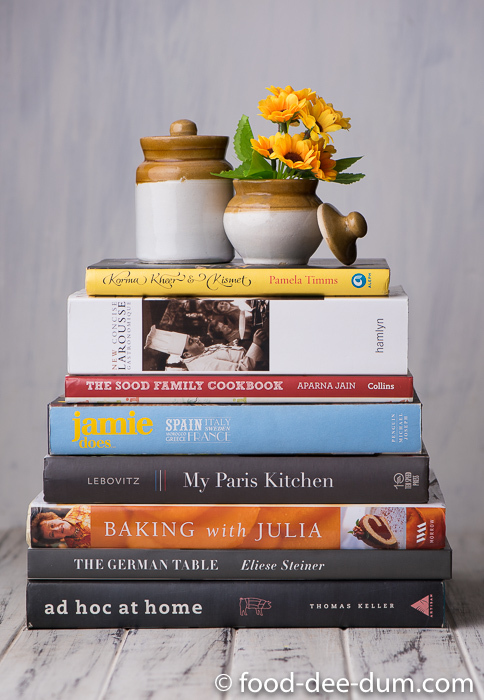 But not enough of a craving to prompt me to bake a whole cake or make mousse or tarts. Something that a small square of dark chocolate from the fridge could totally satiate. But, thanks to the fact that the concept of just one square of chocolate is alien to AK, I have recently stopped stashing chocolate and ice cream in the fridge. As a result, I no longer have easy access to my one square when I want it! Last Friday, I had one such craving after a pretty late dinner and was in no mood to run to a 24×7 store to go find some chocolate/ ice-cream. So I rummaged through my store cupboard and was almost about to give up when I chanced upon an unused tin of condensed milk! And I knew exactly what I had to do. I remembered an old fudgy-squares recipe I used to make out of a childrens’ cookbook many years ago. It was one of those easy recipes that my mom was happy to let me make unsupervised in the kitchen, even when I was much younger, while she attended to other chores around the house. It requires minimal cooking – actually just heating and melting the sauce ingredients until they could be whisked together. in fact, I’m sure it could be done in the microwave too, even though I haven’t tried. 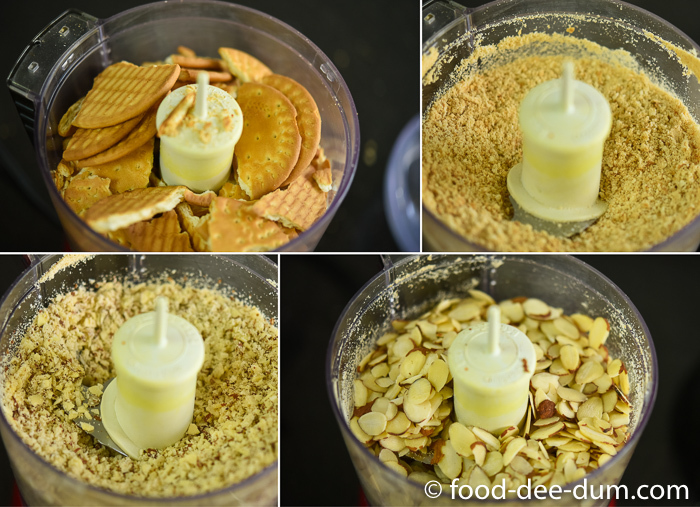 I use a chopper/ mixie now to powder the nuts and biscuits but it can easily be done using a rolling pin and a ziplock or a clean kitchen towel. So you see, it makes a great weekend project with kids as well. Totally safe and fun! The best part – it takes only 10 minutes to make and you can eat them fresh even while they aren’t set in shape or chill them well and store them in an airtight box for a quick snack with your evening coffee. They’re great when crumbled into an ice cream sundae with more nuts and sauce as well. The one thing I can say for sure is that 1 little batch isn’t going to last in your fridge for more than a day. But that’s okay, because it only takes 10 minutes to whip up another! First, I powdered the biscuits and the almonds, separately, into crumbs or meal. I processed them separately so they would powder better, but mixed them up once done. Before I did so, though, I set aside 2 heaped tbsp of the almond meal on a plate and mixed it up with the desiccated coconut. Once I had mixed the biscuit-almond crumbs together, I set them aside in a steel mixing bowl until I got the rest ready. Placing all the other ingredients – the condensed milk, the butter, sugar, honey and cocoa – in a saucepan, I set it on medium heat to melt. Stirring continuously, I heated the ingredients just until everything melted and combined to make a thick ganache-like mixture. Taking the saucepan off the heat, I poured the chocolate mixture over the biscuit-almond crumbs and mixed it all very well with a metal spoon and eventually my hands. The mixture will seem very sticky but you will be able to roll it easily without greasing or wetting your hands. 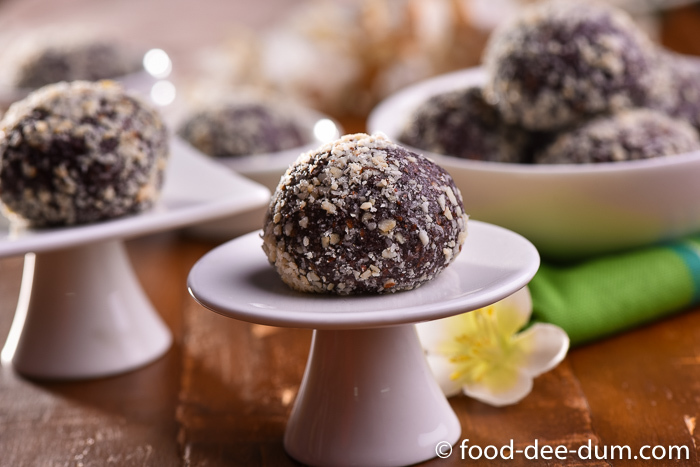 Take heaped tablespoons of the mixture and roll it into ladoo-like balls, roll each in the almond-coconut mixture to coat and set them on a baking tray lined with butter paper. Cover loosely with foil and place the tray in the fridge for an hour or so to let them set in shape. The honey & condensed milk makes them a little heavy so they may flatten a bit at the bottom while they set. That’s it and you’re done. Eat them warm and soft if you’re feeling greedy. Or let them chill and set properly into balls. 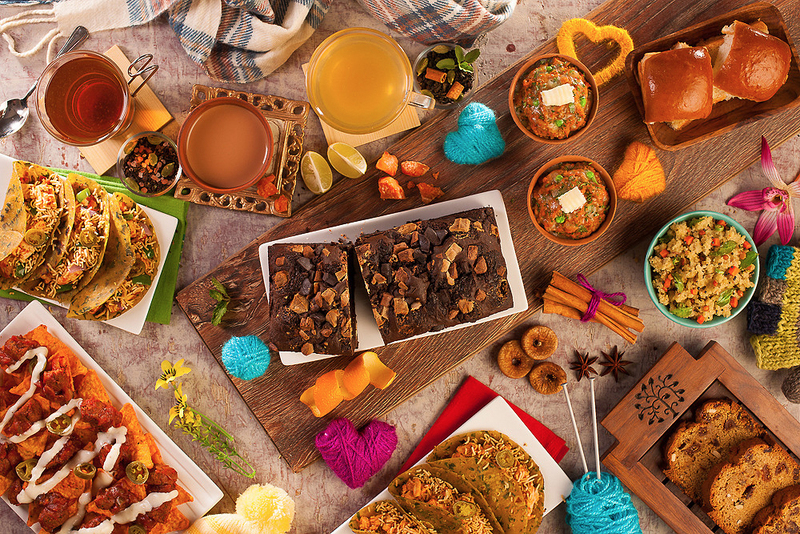 Serve as a dessert wrapped in pretty coloured foil (like chocolates or rum balls), as a snack with coffee or break them up and throw them into an ice cream sundae with more nuts and chocolate sauce! You can substitute the almonds with cashews or pistachio if you prefer. Or you can add 2 tsp of instant coffee powder to the chocolate mix during the cooking stage for a bit of a caffeine kick. You can even set the whole mixture in a tray and cut into squares like fudge. Oh and… okay this is getting out of hand. The point is that they are so quick, so easy and delicious that you can play around with the recipe for ever and still not be bored by it! Don’t forget to store what’s left in an airtight jar in the fridge. 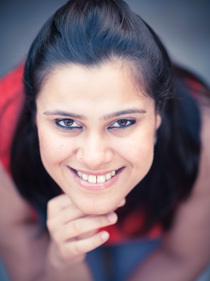 The butter and honey will make them soft and melty if left outside at (Delhi summer) room temperature! You won’t be making these just once. I can tell you that. I’m willing to bet on it. A 10 minute, no-bake, eggless, chocolate dessert - perfect as itself or as an ingredient in a decadent ice-cream sundae! Powder the biscuits in a processor or place them in a clean ziplock/kitchen towel and bash them with a rolling pin. Empty into a mixing bowl. Powder the almonds as well. Reserve 2 tbsp of the almond meal and add the rest to the biscuit powder. Mix them up. Mix the reserved almond meal and the coconut in a plate and keep aside. 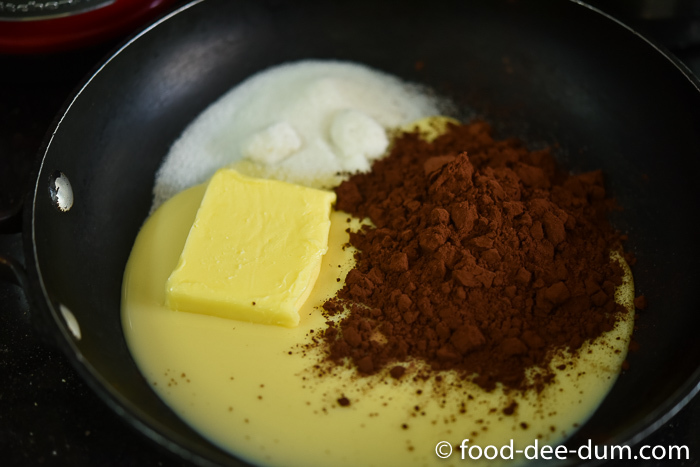 Place all the other ingredients in a saucepan - the condensed milk, the butter, sugar, honey and cocoa - and place over medium heat to melt. 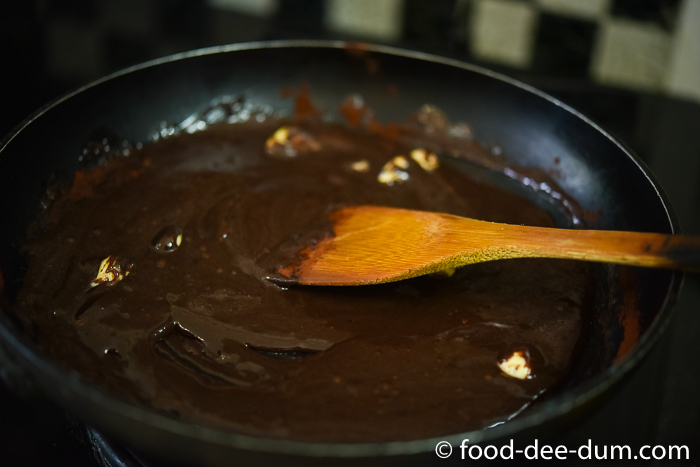 Cook, stirring continuously, just until all the ingredients have melted and combined well to form a ganache-like mixture or a thick chocolate sauce. Remove the saucepan from the heat and pour the sauce over the biscuit & almond meal mixture. Mix it all up using a metal spoon. Line a baking tray with butter paper or parchment paper. 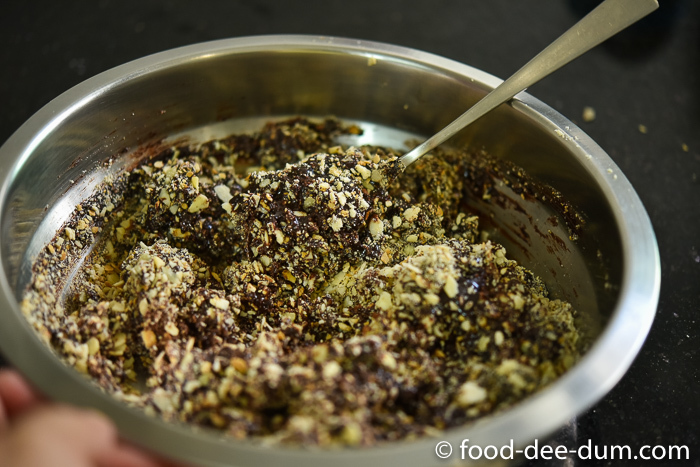 Taking heaped tablespoons of the chocolate mixture, roll them into balls. 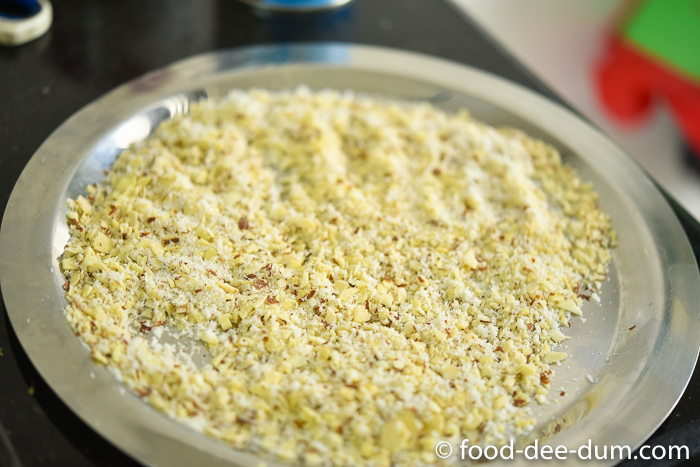 Roll each ball in the almond-coconut mixture plate to coat it and arrange on the baking tray. Loosely cover with foil and place in the refrigerator to chill and set. 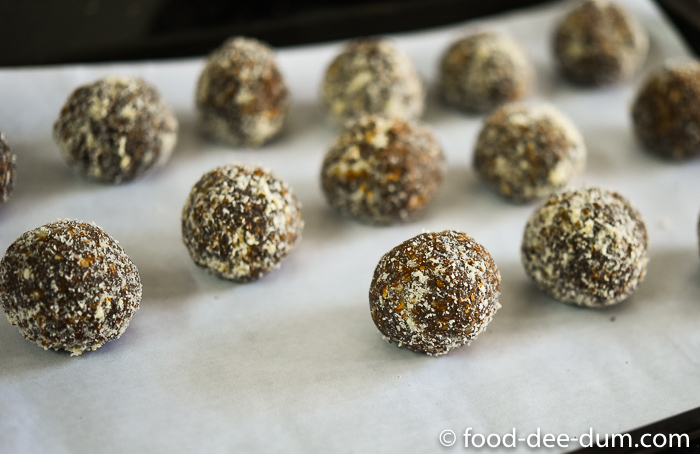 The chocolate balls are ready to consumed within 1 hour of setting. Serve them as is, or covered in pretty foil paper like chocolates or crumble into a decadent ice cream sundae with more nuts and chocolate sauce/ caramel sauce. The remaining chocolate balls, if any, should be stored in an airtight jar in the fridge until consumed.